LESReady! Co-Chair and GOLES Executive Director Damaris Reyes discusses the neighborhood’s experience during Superstorm Sandy. What can someone living in an informal settlement in Mumbai learn from an Occupy Sandy volunteer? How does the state of Kerala monitor and assist its handicapped and disabled residents during a disaster – and what can New York City learn from that system? These were just some of the topics of conversation between LESReady! 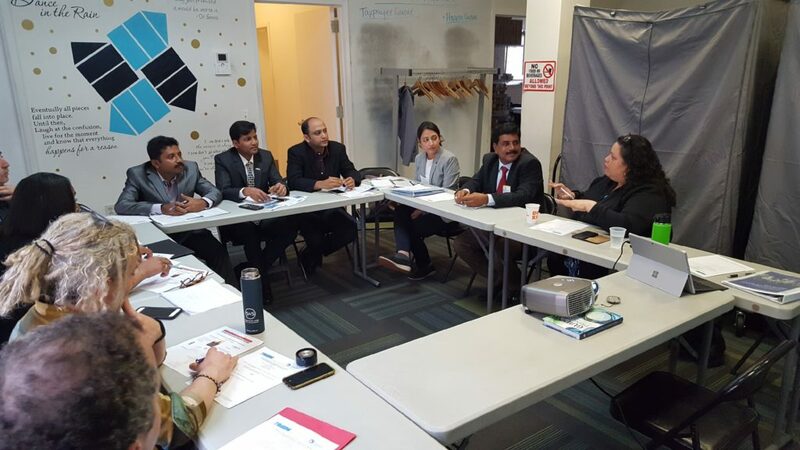 members and the Crisis Management and Resilience in Coastal India project, a group of five resiliency professionals visiting the U.S. at the invitation of the State Department. From April 1 until April 19, the group is visiting Washington, D.C., New York City, North Carolina, New Orleans, and Seattle, learning about efforts to adapt to rising sea levels and other coastal risks. During their time in NYC, they reached out to LESReady! to learn about the role that community-based and non-governmental groups play before, during, and after disasters. LESReady! was thrilled to host the group and participate in this discussion. As coastal cities around the world adapt to climate change and rising seas, knowledge-sharing and dialogue like this is increasingly important. We hope the lessons learned in the LES are taken back and applied in Chennai, Mumbai, and Kerala! Thanks to the U.S. Department of State’s International Visitor Leadership Program for suggesting the meeting and the New York Community Trust for making LESReady’s work possible. The hoard of recent hurricanes have set record breaking and unprecedented flooding throughout the Caribbean and United States, leaving many small islands utterly devastated. As a community filled with boriquas of the diaspora, LESReady! deeply feels for our family in Puerto Rico. Hurricane Maria brought chaos and devastation to Puerto Rico, which was at one of its weakest states having endured Hurricane Irma just days earlier. Coupled with Puerto Rico’s long recession, and its debt crisis– we must rise to support Puerto Rico. LESReady! Is a community-centered disaster response group that focuses on the Lower East Side. When Superstorm Sandy hit NYC nearly five years ago, community members, community-based organizations, block and tenant associations banded together to take care of one another. Recognizing the need for more coordination across our community groups in the case of a future disaster, we formed LESReady! the March following Superstorm Sandy. We remember the support that came far and wide when we were recovering from Sandy. We remember how low-income communities of color, and those which lie at the margins of our society, were the ones most disparately impacted. As a long-term community-based recovery group, we know very well that community-based organizations are the first to respond, and perhaps more significantly, will be the last to leave. For these reasons, it is time that we rise in solidarity of our siblings in the Caribbean. Below, please find suggested places to donate monetarily, a list of local drop-off sites for goods, information on how LESReady! is mobilizing, and our commitment to provide up to date information on how to contact loved ones in Puerto Rico as that information becomes available. LESReady! is closely monitoring immediate supply needs and assessing shipping logistics to establish an LES-wide collection drive for Puerto Rico and other hurricane-impacted areas if logistics allow. If you are interested in being listed as a drop-off location, please fill out your information here. Collecting: Toiletries, Diapers, new or clean blankets, water, batteries, dry food, etc. We are connected to La Red De Apoyo Mutuo a Puerto Rico, a network of individuals and groups throughout the United States that are working on compiling on the ground information. We have expressed the need echoed from fellow community members for information on how to contact loved ones. As we attain more information, we will keep people aware of information on how to contact loved ones as that information emerges. We remember. We rise. We Resist. On March 24 the City released its 13th Proposed Amendment to the East Side Coastal Resiliency Project, based on community feedback and new design challenges. LESReady! spoke out about the importance of climate science and the need to defend against displacement, both natural and man-made. Read our comments here: LESReady! Public Comments to ESCR Amendment 13.